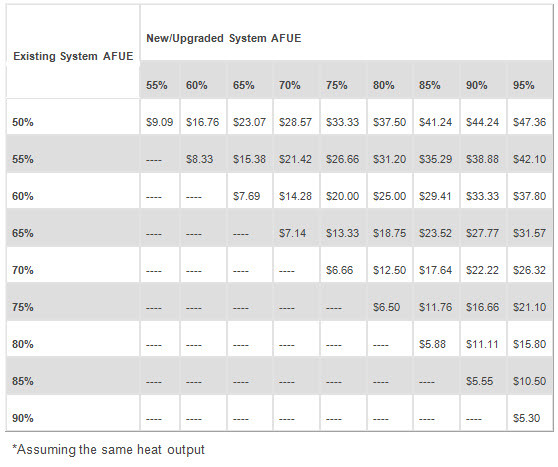 Source of table http://energy.gov/energysaver/articles/furnaces-and-boilers*Assuming the same heat output There are many things that need to be looked at when choosing the appropriate boiler. Contact All Climate Mechanical today to schedule an appointment to discuss your options. If your apartment building, commercial building or home is currently being heated by a boiler that is inefficient, old, breaking down constantly or the wrong size for your space the best thing you can do is replace it with new, higher efficiency unit. There are many things that need to be looked at when choosing the appropriate boiler. Contact All Climate Mechanical today to schedule an appointment to discuss your options.